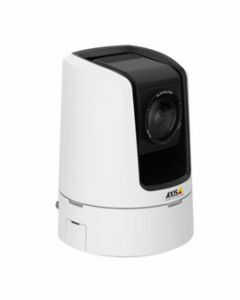 AXIS V59 PTZ Network Camera Series offer cameras with smooth pan/tilt/zoom, high quality audio and powerful 30x zoom. They are designed to stream and webcast audio and video in a variety of applications. The open interface makes it easy to integrate with other systems and share information with a broader audience such as in auditoriums, classrooms, as well as peer-to-peer communication in video conferencing. AXIS V59 Series offer high-definition video in up to HDTV 1080p resolution. Camera settings are optimized to produce video with high-color fidelity in studio environments. The smooth pan/tilt/zoom function is easy to control from the camera's web page and makes it possible to follow movements in a live production situation and zoom in on details of interest. All prices listed below exclude VAT.